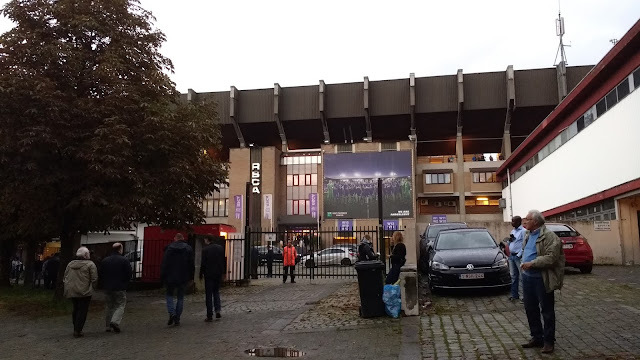 1: The club's full name is Royal Sporting Club Anderlecht. They were formed in 1908 at the Concordia Cafe in Anderlecht. They joined a competitive league for the 1909/10 season. 2: Anderlecht has won the Belgian First Division a record 34 times - the first following the end of World War 2 in 1947 and the latest last season. 3: Domestically, the second division title has been won twice, both prior to the outbreak of war. The Belgian Cup has been won 9 times, the Belgian League Cup once and the Belgian Supercup 13 times. 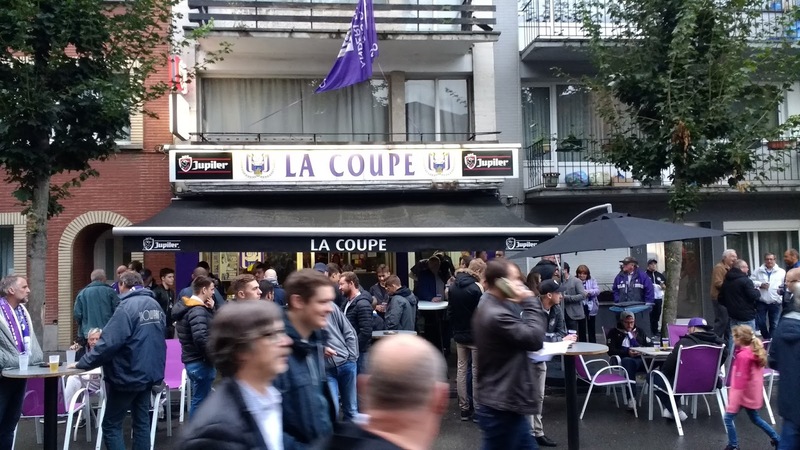 4: In European competition, Anderlecht has won the Cup Winners Cup twice, the UEFA Supercup twice and the UEFA Cup once. 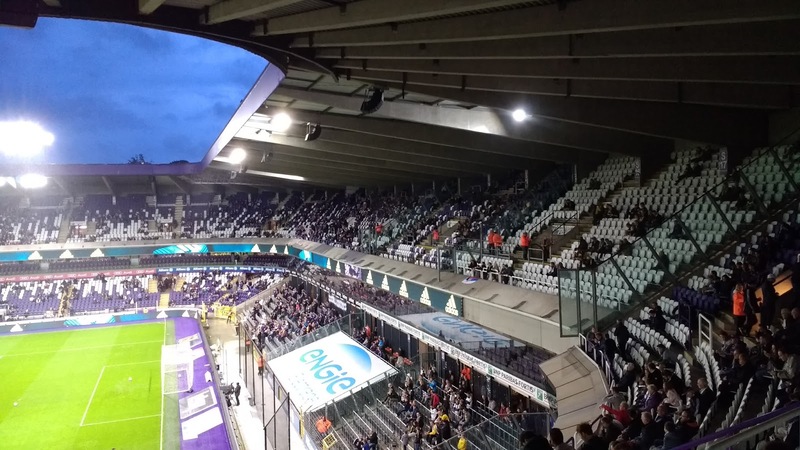 5: The Constant Vanden Stock Stadium has a capacity of 28,000, reduced to 21,500 for European games where the standing spaces are closed. It's named after a former chairman and was formerly known as the Emile Verse Stadium. So after months of planning and waiting, it was time for me to be Belgium bound. Back in July, I'd decided on this trip when I saw that Eurostar tickets were just £29 each way and so after checking football fixtures I bought the tickets and also booked a hotel. 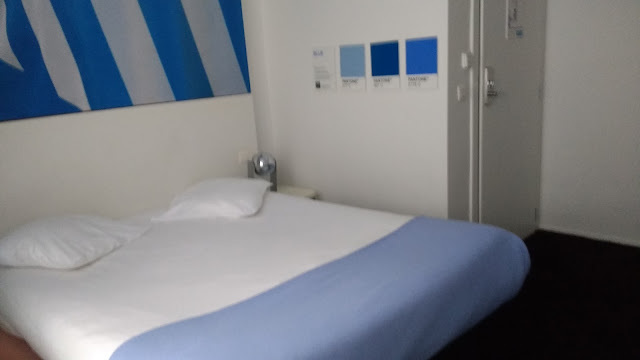 I went for the mid -range option, whilst I'm happy to take a risk on a hotel with poor reviews in the UK, I'm a bit fussier abroad due to potential language barriers. After getting insurance sorted, the next thing was to see what games I could pre book tickets for. Unlike KV Mechelen's site, which was unusable unless you had a Belgian bank card, the Anderlecht one was a charm to use with seat chosen and paid for on my credit card within a few minutes. The cost was pretty reasonable too, working out at less than £25 for a seat in the upper tier in the corner of the stadium. With that booked a few weeks in advance, there were a few late changes to my plans. Firstly I'd not had a lot of luck with digital cameras, dropping my first one at Wembley on Monday, meaning it needed a repair and then the replacement I'd bought from my local cash converters store turned out to be faulty, with a spot on the lens which ruined pictures. I was not happy, especially when I went to return it on Thursday and not being able to get a refund as the manager was off. 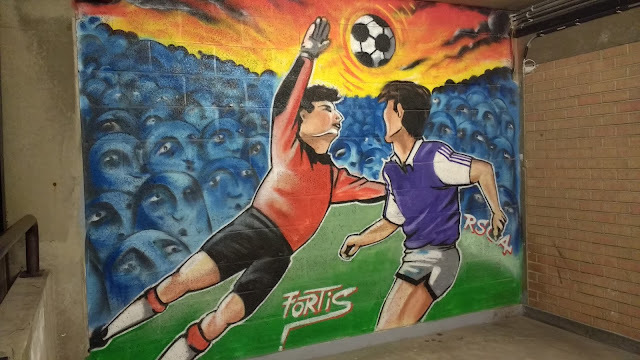 I'd also seen a game at the last minute in Torhout. It would cost me 32 Euros return on the train and whilst it was tempting, I decided to leave the decision until the last minute as lots of rain was forecast. I'd rather spend the money on something else, rather than a wasted journey due to a waterlogged pitch. On the day, I woke just before 8 am after a decent nights sleep. Initially, I was not planning to leave until around 10 as my Eurostar didn't leave until 1. But then I had a last minute thought, was there any shops near Kings Cross where I could get a potential digital camera. My phone camera was fine, but it had no zoom. Islington had a cash converters and it was only 15 minutes walk away. I decided to call in on the off chance, so after having breakfast and getting my stuff together, I left at 9. I stopped at Tesco en route as I was very low on petrol and also wanted a few bits. A tenners worth of petrol, a paper, some kettle chips and some Irn Bru bought and I was on my way. I'd decided to go from Chalfont as there were more free parking choices there. After a few unsuitable roads, I dumped my car in a road called Cumberland Close. Time was tight by now and so I had to jog to the station. I made it by the skin of my teeth, getting to the platform just as my train was leaving. I started my blog for today whilst on the train and after that was done, caught up online and read my Daily Star. Soon enough I was at Kings Cross with some time to spare. I walked the 15 minutes to Islington, which looked a decent place. I'd only seen it in films starring Hugh Grant and imagined that the cash converters might have something decent on the camera front. 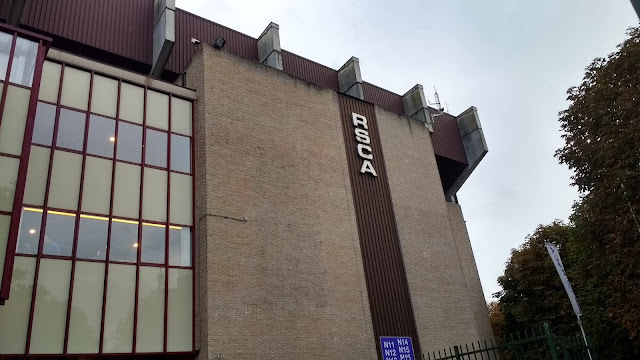 It couldn't be further from the truth, there were just a couple of scabby cheap cameras that even my 15 month-old budget smartphone put to shame. I walked back to the station, still with time to kill. I fancied a pint, but with nowhere decent open until 12, I headed back to the station. There was supposed to be a decent pub in the station called 'The Curious Pig' but wandering round, I couldn't find it. The 'Sourced Market' had some interesting looking ciders, but with the one I fancied costing £8 a bottle, I decided to give it a miss. I went to the Eurostar check in just before 12. It was a lot less hassle than going via plane with the whole process of luggage check, ticket check and passport control taking around 15 minutes. There was also the advantage of being able to take liquids and I'd used that to full effect with cans of Irn Bru and cider in my bag. I was glad of this with it a fiver a bottle in the departure lounge and I enjoyed a couple of cans with some Kettle Chips as I counted down the 50 minutes until departure. The lounge was nice enough, but the trains themselves were a bit grubby and run down. I realized on my journey that I'd left my headphones at home on charge and was glad that I had plenty of magazines on my iPad to keep me entertained on the journey. The journey took just over 2 hours, with me getting to Brussels at just after 4.20 thanks to a 10-minute delay. 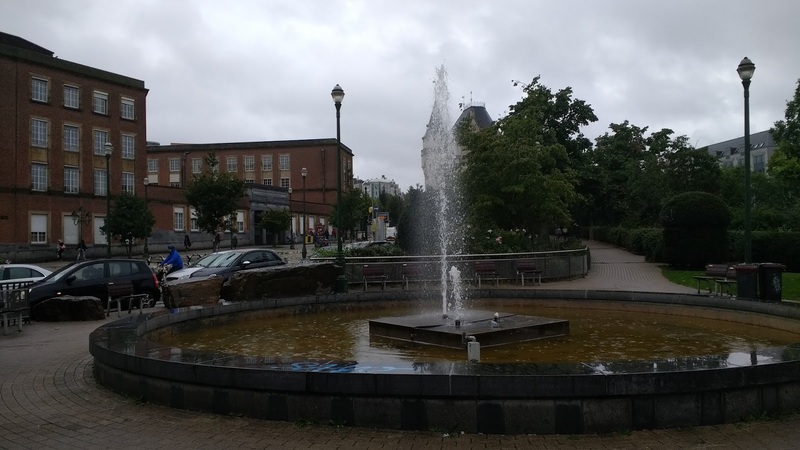 It then took me a bit longer than intended due to rain, but it was nice just to be able to walk out of the station without going through passport control. I got to my hotel at 5 and as I was drenched and sweaty, I had a quick shower. After getting dressed again, I went and picked up the essentials - snacks, drinks and of course some cherry beer for if I manage to make it back for Match Of The Day tomorrow night. I had one of the cherry beers- a Belle Vue Kriek Classique whilst I used the hotel Wifi and let my phone charge to its full capacity. I left my room at 6.30 and with the weather being dry for the moment and it only taking 20 minutes extra, I decided to walk the 4 miles to the stadium. Or at least that was the plan until Google Maps tried to take me down a route that didn't exist. I then made my way to the bus station, first trying an Uber that got canceled by the driver, before trying for a bus. The routes given by Google Maps were completely different from what the notices at the bus station said, so I gave up and got a taxi from the station. 8 Euros wasn't the end of the world and so after picking up my ticket and getting a free programme, I went to a local bar for a pre match cherry beer. After a Frikandel, curry sauce and chips which cost me €5.50, I went in the ground and took my seat. It was a decent view and I sampled the pre match atmosphere while I waited for the game to start. Anderlecht dominated from the start and were ahead after just a few minutes. 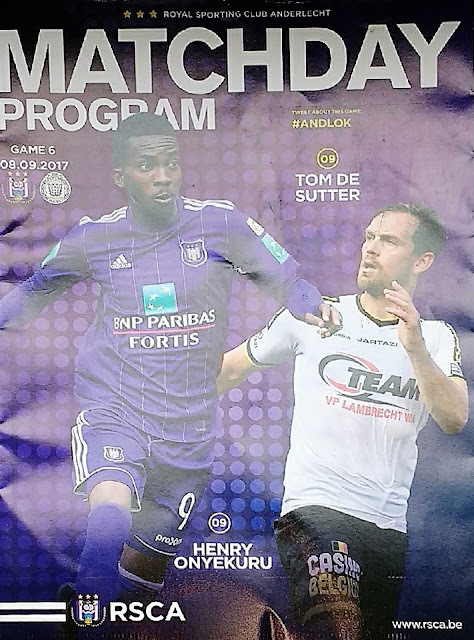 A good through ball found Henry Onyekuru and despite Lokeren claiming offside, the simple finish was allowed to stand. There was no mistaking the goalscorer thanks to the animated score boards and the enthusiastic announcer. This woke Lokeren up and they went up the other end and got the equalizer. 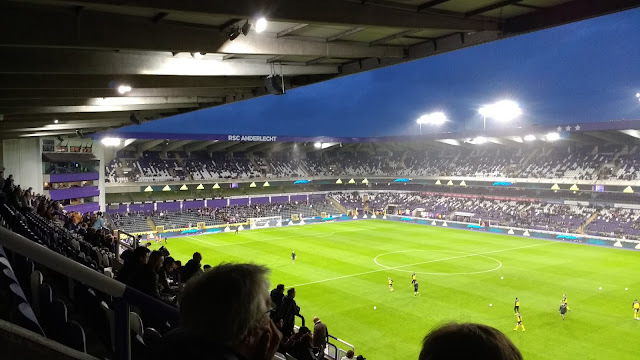 This time it wasn't as obvious who scored, but despite two good saves by the Anderlecht keeper, the ball fell to Marco Miric who blasted into the roof of the net from around 6 yards. The game had started at some pace and it was obvious that it would not last. Whilst the football remained decent, chances became less frequent and the game drifted into each team having good spells. 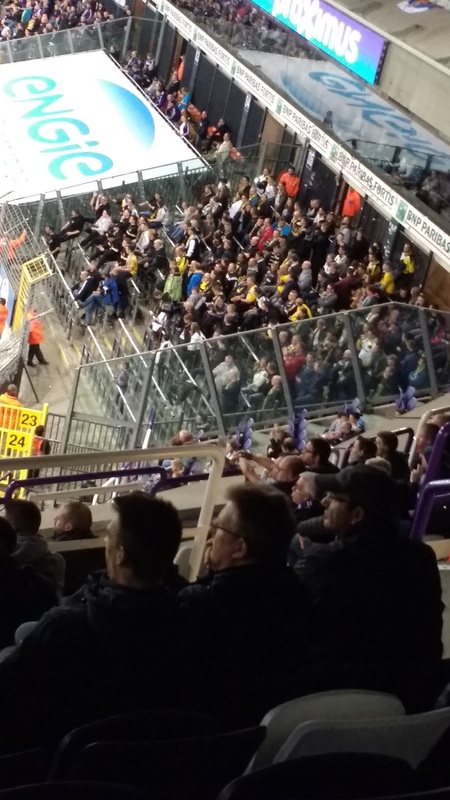 It was during one of Lokeren's that they took the lead. On 35 minutes the ball was squared across the edge of the area and Iceland defender Ari Freyr Skulason was there to drive a curling shot into the bottom right-hand corner. I was quite pleased for the visiting fans. They'd been stuck in the bottom corner of the ground, with them being low down and a fair way from the action. 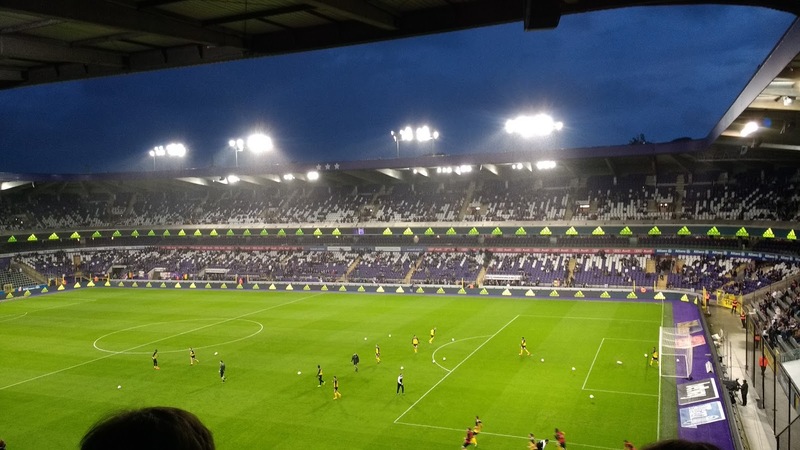 Anderlecht dominated the second period with Lokeren clinging on and doing what they could to run down the clock. It's a tactic that my own team Wycombe use and I'm not too keen on it as it just invites pressure. 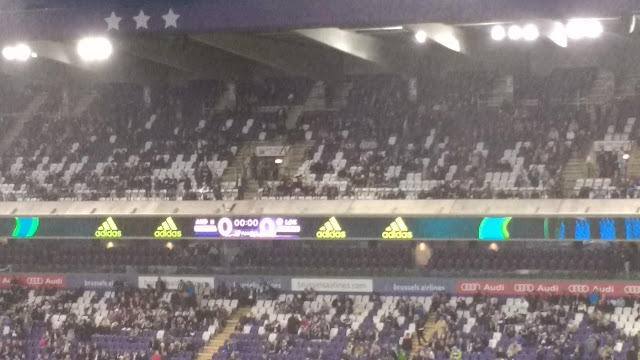 The visitors had shaded the first half and for a while, it looked as if Anderlecht weren't going to score, no matter how hard they tried. I looked at the league table at half time and was surprised to see both teams struggling in the bottom half of the table. Finally, the pressure told and on 77 minutes, Onyekuru got his second with a scrappy equalizer. The hosts thought they had gone ahead a minute later, but it was ruled out for offside. Just as Lokeren thought they had a point in the bag, Anderlecht grabbed a last minute winner. Substitute Nicolae Stanciu put in a cross and Lucasz Teodorcyzk slid the ball home. This led to both sets of fans baiting each other as six minutes of injury time was announced. The visitors pressed for an equalizer and were nearly caught out on the break, Onyekuru missing the chance of a hat trick when his late shot hit the post. Unlike English grounds, where you get fans leaving early, barely any did here. 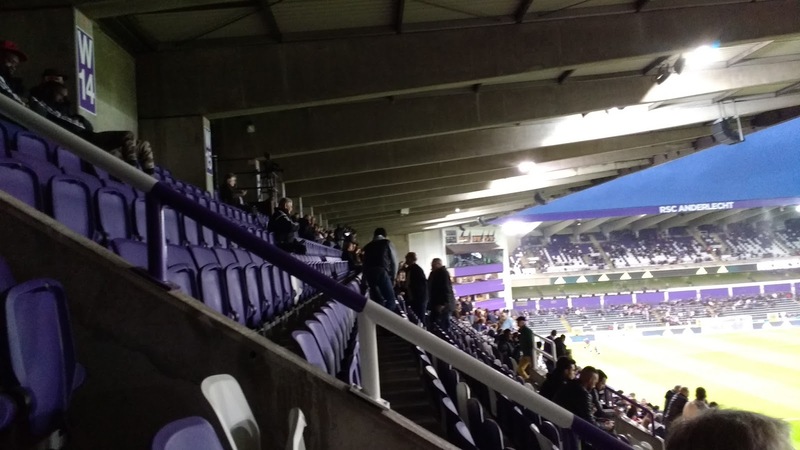 In fact, both sets of fans stayed long after the final whistle to cheer their players. After the game, not sure about public transport, I decided to walk back to my hotel. This time the 4-mile walk back went without any major hitches and after walking through Anderlecht and Brussels, I was back at my hotel by 11.30. I did consider going for a drink, but with my phone battery flat and having some bottles of cherry beer, I decided to stay in. I was going to use my laptop to type up my match report, but with me forgetting my travel plug, I had to ration it's use. All my USB devices were fine, as I'd bought a charger with a European plug. I stayed up until around 1, typing this blog, chatting online and watching YouTube videos. THE CONTANT VANDEN STOCK STADIUM is a pretty decent stadium to watch football. The stands are 4 separate ones as opposed to being a bowl, but even so the atmosphere is pretty well contained, thanks to some of the corners being filled in. The view from my seat in the top corner was very good, although the leg room was acceptable, but not overly generous. 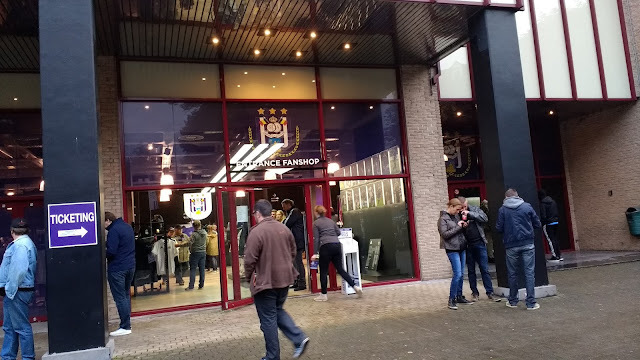 The club shop was large, but expensive and quite crowded. The free programme was a nice touch though. Food and drink options around the ground are numerous and from my experience are a touch more expensive than further afield, but not unreasonable.